Camarillo, CA – Marshall Blonstein’s Audio Fidelity will be releasing the ultimate “best of” collection by folk legend Judy Collins on Quad 4.0 Hybrid SACD. Colors of the day – The Best of Judy Collins first arrived in record stores in 1972. The recording features Collins’ earliest, most time-honored recordings. The song that propelled the album sales was her number one hit, “Both Sides Now,” an alluring Joni Mitchell tune that dominated the charts for months. Collins’ voice is remarkably beautiful, her phrasing, her ability to enunciate and her vocal range place her in a category by herself. Her amazing talent is on full display in this excellent collection that includes Collins’ explorations into folk-pop, country-pop (“Someday Soon,” an Ian Tyson classic), British folk (“Sunny Goodge Street,” The Beatles “In My Life”), and gospel (“Amazing Grace”) that clearly show her eclecticism. Judy Collins’ 1974 Oscar Nominated Documentary About The First Female Conductor Of Major Orchestras To Be Re-Released On DVD! Los Angeles, CA – Antonia: A Portrait Of The Woman, the celebrated documentary film about the first woman conductor of major orchestras in the U.S. and Europe, Antonia Brico, will be re-released on DVD this November. Folk music icon Judy Collins produced and co-directed this highly acclaimed 1974 Academy Award nominated documentary film, which explores themes of gender discrimination that are still highly relevant today. An unforgettable and inspiring figure, Brico faced hardship after hardship, overcoming enormous obstacles and prejudice to pursue her life’s passion in the male-dominated field of classical conducting. Alongside co-director Jill Godmillow, Collins tells the story of Brico, her former piano teacher, with tremendous emotion and skill using both historic newsclippings as well as an in-depth interview with the Maestro herself. This 2015 Edition includes the feature-length film as well as bonus features including a photo gallery and commentary tracks, plus a brand new interview with Collins who reflects on the personal and professional impact of Brico’s life and pioneering spirit. HOLLYWOOD (Herald de Paris) – Judy Collins has inspired audiences with sublime vocals, vulnerable songwriting, personal life triumphs, and a firm commitment to social activism. In the 1960’s, she evoked both the idealism and steely determination of a generation united against social and environmental injustices. Five decades later, her presence shines brightly as new generations find solace in her iconic 50 album body of work, and heed inspiration from her spiritual discipline to succeed in the music industry for half a century. She is the Judy of whom the Crosby, Stills, Nash and Young’s 70’s anthem, Suite; Judy Blue Eyes, pays homage. The award-winning singer-songwriter is esteemed for her imaginative interpretations of traditional and contemporary folk standards and her own poetically poignant original compositions. Her memorable and haunting rendition of Joni Mitchell’s “Both Sides Now” from her landmark 1967 album, Wildflowers, has been entered into the Grammy Hall of Fame. Judy’s dreamy and sweetly intimate version of “Send in the Clowns”, a ballad written by Stephen Sondheim for the Broadway musical “A Little Night Music”, won Song of the Year at the 1975 Grammy Awards. She’s garnered several top-ten hits as well as gold and platinum selling albums. Recently, contemporary and classic artists such as Rufus Wainwright, Shawn Colvin, Arlo Guthrie, Joan Baez, and Leonard Cohen honored her legacy with the albumBorn to the Breed: A Tribute to Judy Collins. Judy began her impressive music career at the age of 13 as a piano prodigy, impressing audiences performing Mozart’s “Concerto for Two Pianos”, but the hard luck tales and rugged sensitivity of folk revival music by artists such as Woody Guthrie and Pete Seeger seduced her away from a life as a concert pianist. Her path pointed to a lifelong love affair with the guitar and the pursuit of emotional truth in lyrics. The focus and regimented practice of classical music, however, would be a source of strength to her inner core as she navigated through the highs and lows of the music business. For the rest of the biography and the interview, please visit the Herald de Paris website! Los Angeles, CA – Judy Collins has inspired audiences worldwide for over five decades with her sublime vocals, boldly vulnerable songwriting, personal life triumphs, and a firm commitment to social activism. March 18th 2014 will see the much-anticipated release of JUDY COLLINS LIVE IN IRELAND, CD/DVD on Cleopatra Records. Recorded September 29, 2013 at Dromoland Castle for PBS broadcast, LIVE IN IRELAND is scheduled to run on THIRTEEN NYC, WGBH Boston & PBS affiliates nationwide March 5th. 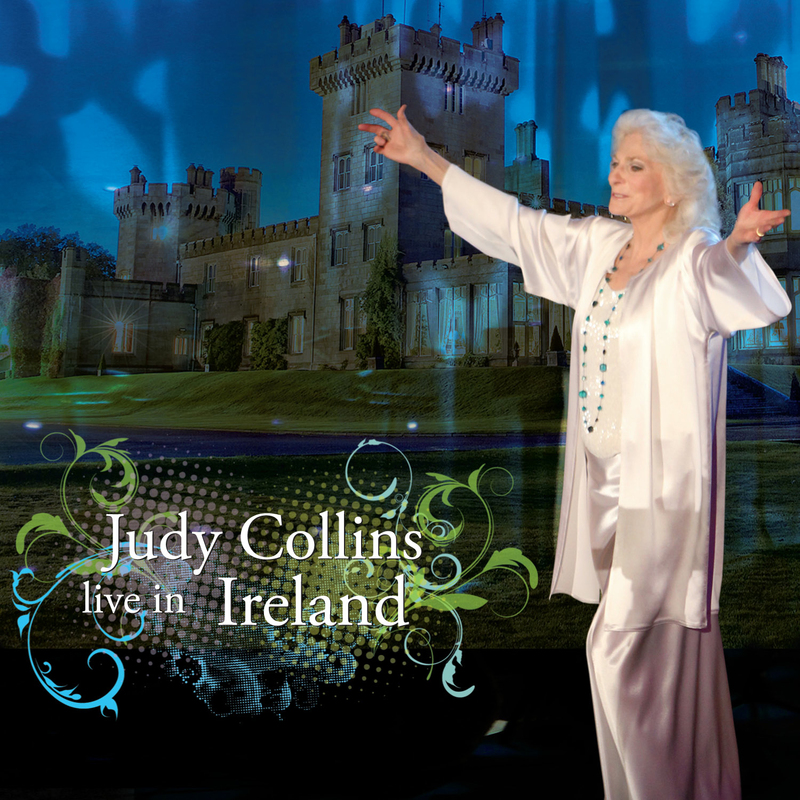 Now fans worldwide in the comfort of their homes can enjoy time and again this spirited and inspiring set of Judy’s most beloved hits along with her favorite Celtic folk songs and stories (including duets with Irish singer Mary Black & NY singer-songwriter Ari Hest). In the 1960s, she evoked both the idealism and steely determination of a generation united against social and environmental injustices. Her landmark works helped form the backbone of American folk music. Judy’s luminescent presence shines brightly as new generations bask in the glow of her iconic 50+-album body of work, and heed inspiration from her spiritual discipline to thrive in the music industry for half a century. LIVE IN IRELAND showcases a living legend whose career continues to blossom with each new release.